Some of you expressed an interest in hearing more about my ‘day job’. This is something I have largely avoided on my blog because a lot of it is confidential, as you can probably understand! There are snippets I can show you though, so here is the first in a series of occasional ‘Industry Insight’ posts. Although it is Spring 2016 showing in New York and London, here in New Zealand the opposite is happening. Our Winter 2016 collection is showing, and even though the agents are still out there selling, production has already begun. For me this means it is grading season! All the selling samples in our collection are made in size 10/Small. 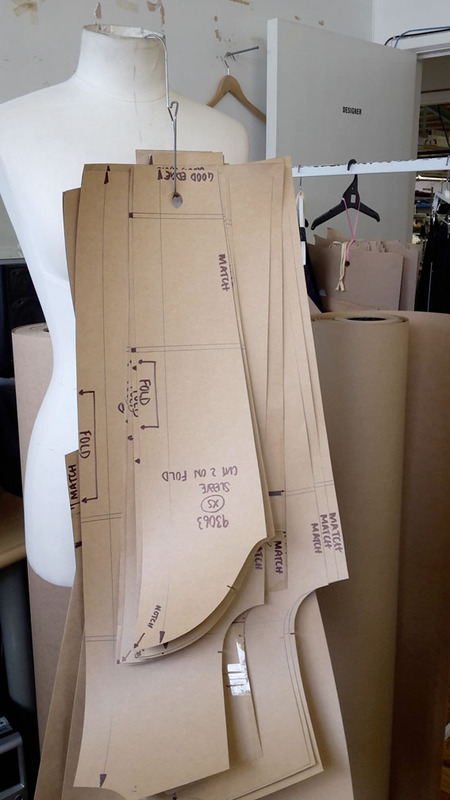 As a patternmaker it is really convenient for fitting purposes that I am almost a perfect size 10 too! 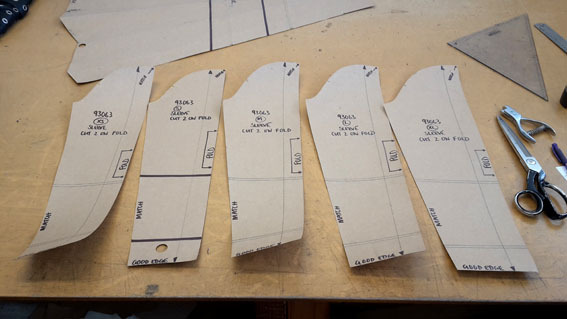 Obviously the rest of the world is not a size 10 as well, so patterns for all the other sizes need to be created before garment production can proceed. At my workplace we do this by manually grading sizes up and down from the size 10 (S) pattern. 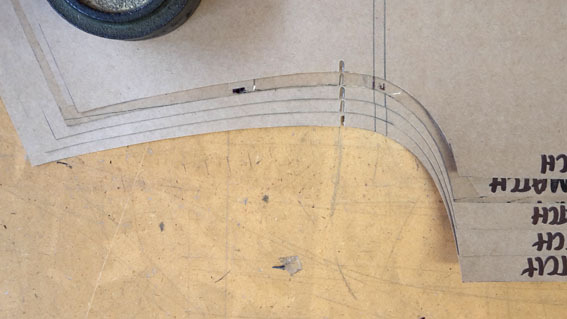 Yes it is all done by hand – and there is a lot of cutting to do! Larger organisations might use a CAD system but we still do it the traditional way. 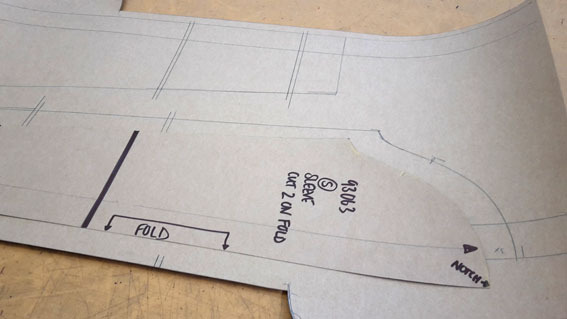 We usually grade five sizes in total – XS/S/M/L/XL (3 up, 1 down) and sometimes we grade an XXS or XXL if they are requested by buyers. This simple top took only an hour to grade, but the lined coat-with-a-zillion-pieces I graded earlier in the week took me the whole day! Grading can get a bit monotonous, but it is also therapeutic after the stress and deadlines of producing a sample range. Most of the styles will be graded in the next month or two, and then the fashion cycle begins all over again as we start to design our Spring 2016! Is there a website of the company you work for, so that we can see the garments they sell? Thanks for posting this. It is interesting. Sounds like there is no 'quiet time' of year in the garment industry! Thanks for sharing! I worked in production as a technical designer is this brought me back to those days. 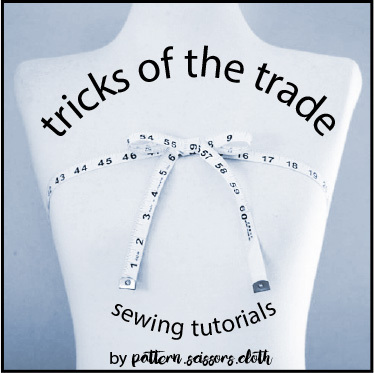 Even within the industry, there a many trade secrets. Super interesting! I'd love to see more of the behind-the-scenes at your work, if you can share it with us. Very interesting, I love to hear what goes on behind the scenes! Thanks for sharing! 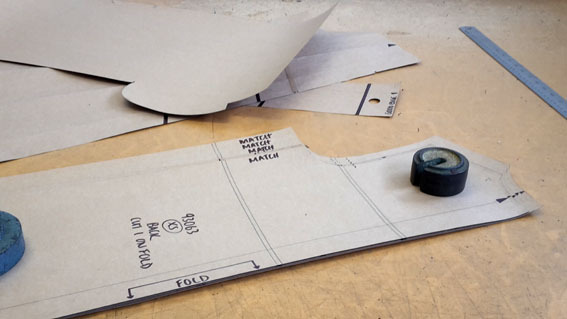 I was surprised to see a sleeve pattern with a fold line. How will that work on the marker? I'm kind of reluctant to disclose the company I work for, to retain the privacy of where I live Karien – I hope you can understand! No marker necessary Lisa! This pattern is for knit garment cut from a circular knitted panel – one body piece and half a sleeve (ie, on fold). Who was the AUT tutor Jo? They may have taught me! We have a few students from AUT and other universities doing work experience every now and then. Lovely to see the manual approach still being used comercially- we use CAD and I always feel something is lost with digitization (though appreciate its speed). When ever I'm back in Auckland for a bit I refresh my skills with Don & Anne so as not to lose them! Wow, amazing that you do your grading manually. I took a class in CAD grading and we never really discussed the benefits over doing it by hand vs CAD. What a great day job – thanks for sharing!